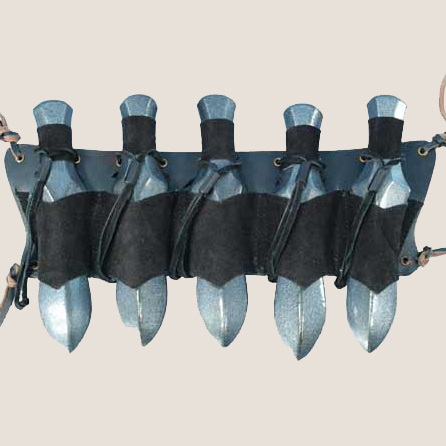 This Throwing Knife Holder is made out of a heavy duty, back-sueded leather 1/8th" thick, and is designed specifically to hold five of the the Iron Fortress Throwing Daggers. Say no more to daggers that rattle around loosely! And never tuck your Throwing Knives into your belt - that causes accelerated wear and tear to your weapon. -blade space: 2" x 1.5 oval"
Note that this Throwing Knife Holder does NOT include any Throwing Knives. If you wish to order one or more Throwing Knives from the "Throwing Knives To Include" dropdown below, you will receive a discount on their price!